In tough economic times, people generally look at the unemployment rate to put in perspective the state of the labor market. But as the more economically inclined know, in a really poor labor market, many of the unemployed will simply give up looking for work and leave the labor market entirely. Once someone has left the labor market they’re no longer in the category of the “unemployed.” Thus unemployment appears to decline despite the fact that the number of people technically “out of work” hasn’t changed. In the minimum wage debate, many seem to have forgotten about this phenomenon. Those on both sides of the debate argue over whether or not increases in the minimum wage will lead to unemployment, primarily among the young and unskilled. Yet they tend to overlook the effect it will have on the labor force participation rate of youth. As I’ve written on before, there is considerable evidence that minimum wages are a detriment towards the employment prospects of the young and unskilled. As shown in the chart below, minimum wages also lower the youth labor force participation rate. Dots on the line signify a year where the minimum wage was increased. To provide from exact figures, one study out of North Carolina State University found that the minimum wage hikes in 1978-1981 reduced teen labor force participation by 3.62 percentage points, 1990-91 hikes by 2.07 percentage points, and 1996-97 hikes by 1.31 percentage points. What this means is that not only do minimum wages raise youth unemployment, the true extent to which it raises youth unemployment is masked by the fact that it also decreases youth labor force participation rates. Another overlooked unintended consequence in the minimum wage debate is that of job gentrification. The term “gentrification” is used to describe what occurs when wealthy individuals move into an urban community. As those with higher incomes move in, property values increase, but the poorer residents can no longer afford to live in those areas, so it’s not something they benefit from. Something similar can occur when the minimum wage is raised. 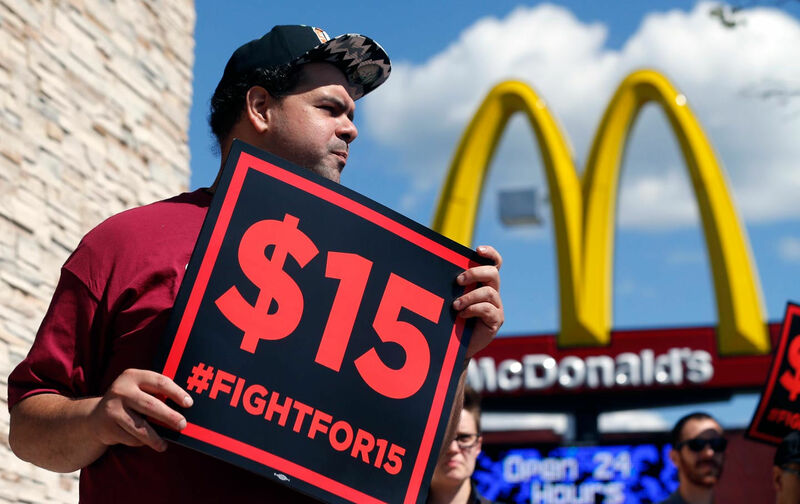 Let’s look at a city like Seattle, where the minimum wage is being raised to $15 an hour. Attracted by the high wage, many of those from outside Seattle will apply for those jobs. If those applicants are more skilled than Seattle residents, they’ll get the job. In other words, the high minimum wage won’t necessarily go to the citizens of the city that its intended for. Put another way, what if an employer of Walmart was forced to pay their employees $15 an hour? They would have to adjust their business model (maybe modeling after a business like Costco), but in the process hire higher skilled laborers. Even if there was no net change in Walmart’s employment, low skilled workers would still be priced out of a job. The higher paying jobs would thus go to those who are already skilled enough to earn those wages, while doing nothing to help the poor workers they’re intended to help. Previous Are 97% of the Poorest Counties Really Republican?